This course covers AL and QL preparing you for the AQL test. Ensure you get a result in your NBT AQL assessment that is reflective of your abilities by enrolling on the AQL preparation course. Give yourself the best shot at getting into your chosen university and university program by completing this online course that is focussed on preparing learners for the AQL assessment. Consisting of videos where experienced, engaging teachers walk students through NBT example questions. This course fully prepares students for what to expect in the NBTs. 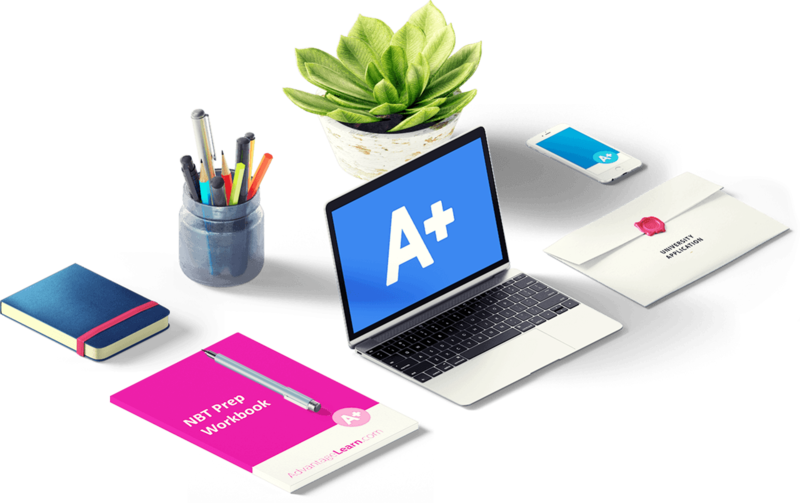 Alongside the teaching videos are notes to download as well as practice NBT quizzes to see how you're performing in each section. Learning Online enables students to work at their own pace. Pause and rewatch videos to make sure you have time to process what you are learning. Repeat our quizzes as many times as you like to check you are able to time-manage during one of the most stressful exams of your Matric year! Ensure you get a result in your NBT AQL assessment that is reflective of your abilities by enrolling on the AQL preparation course. Give yourself the best shot at getting into your chosen university and university program by completing this online course that is focussed on preparing learners for the AQL assessment. Consisting of videos where experienced, engaging teachers walk students through NBT example questions. This course fully prepares students for what to expect in the NBTs. Alongside the teaching videos are notes to download as well as practice NBT quizzes to see how you’re performing in each section. For 4 years AdvantageLearn has been offering this Online course. Our feedback from students has been that after completing this course, then the NBT, they were confident for their test and achieved the grades they needed. Academic literacy (AL). This section prepares learners in how to read text and understand what is being said. Quantitive literacy (QL). This section teaches you how to interpret common numerical questions you will come accross daily, such as percentage changes, distance measurement and reading information from different graphical representations. Mock NBT test. We have created a full mock NBT test so that you can see what it is like to complete the test. Our test is designed to be as hard, if not harder than the NBT. If you can complete this then you can be confident of your NBT test! We believe these are the core elements to learning and we follow this structure in our course. Each section has video lessons to help you Learn how to approach NBT questions. Alongside these are pdf notes so you can Practice with our teachers. Each section ends in a multiple choice quiz so you can Assess your knowledge of that section and see if you need to repeat it. We also have a full Mock NBT to see how you will do in the real test (We have specifically made this a very difficult example of the NBT. If you can get your grade in our mock exam then you can be confident to get it in the NBT). Finally we have a Maths teaching team online available 8.30am-5pm every weekday to answer any NBT question you might Ask. I was blown away by Advantage Learn!!! Excellent service from booking the course to dealing with Mike at IT support and by daughter was very impressed with Trish and found the course very beneficial. Highly recommended. Brilliant. Incredible helpful and valuable. Really reduced my nerves and stress levels! Totally recommend it! I have not written the test yet but the information and the knowledge I have already has made a huge difference and also the confidence I have towards the test is really amazing, I don't want to count the chickens before they hatch let us wait for the test date before I praise you fully.